For anyone needing a refresher on how our federal and state government work, here are some videos to bring you up to speed. Note, these videos were created to help individuals organize against Trump. ColoradoResistance has an excellent primer on how the state government works, see their website. We’re keeping a list (and checking it twice) of groups that are expressing an interest in various “interesting” upcoming elections. If you’d like to see which groups are interested in which elections, please see Interesting Races in Colorado. Find info on all local elections and candidates on the IFRR Wiki. Once you’ve identified who represents you, we suggest 1) putting these folks into the contacts on your phone, and 2) going to their websites and signing up for their electronic newsletters. Once you’re on their mailing list, you will be able to stay current on what they are working on, and you will know when they are holding town halls. Here’s another great resource from March On Colorado and Morgan Carroll about how laws are made in Colorado. When you pick up the phone to call your representatives there are a few things you should say 1) who you are, 2) that you are constituent, 3) where you live, and 4) why you are calling. Below are some sample scripts. Remember, these scrips are just ideas. It is always better to speak from the heart rather than sound like you are reading a script. The more often you call, the more comfortable you will get making these types of calls. Advocate for an independent investigation *and* a special prosecutor. Hi, I’m Amy Activist. I’m a constituent of Senator Gardner’s and I live in Aspen. I’m deeply concerned about the firing of the FBI Director by Trump. I would like my senator to support both an independent commission and a special prosecutor. Thank you. Advocate for thorough vetting of 45’s federal court appointments. Hi. I’m a constituent from Colorado Springs, calling about Trump’s ten federal court appointments. I am asking Senator Gardner to assure they are thoroughly vetted by the Senate, American Bar Association, and approved in the home state of each senator. In light of recent events, this issue is vital to our democracy. So you’re fired up and ready to make some calls, write some letters, and send some tweets. What now? How the heck do you figure out what’s going on in Colorado that needs your attention? CLEAN stands for Citizen Legislative Early Action Network. It was designed to provide everyday citizens like you with up to date information on upcoming bills in the Colorado House and Senate. Click here for more information and to join their electronic mailing list. Please note: clean is run out of the Longmont Dems, but it is designed for all Coloradans. If you are a registered Democrat, consider getting involved at the county level. There are active groups throughout Colorado. These groups are focused on getting Democrats elected throughout your county, which is incredibly important. 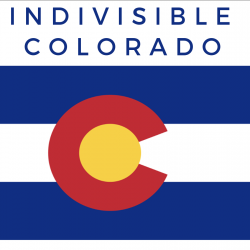 Click on your county to link to your local group: Boulder, Longmont, Larimer County, Denver, El Paso County. Don’t see your county listed? Google them. Sign up for electronic newsletters put out by your county so you know whats going on. Indivisible is for everyone who believes Trump is taking our country in the wrong direction. First, consider switching parties. Just kidding 🙂 Seriously, now is the time to get involved with your own party and fight for democracy versus authoritarianism. Democracy is not a partisan issue. We need your help.